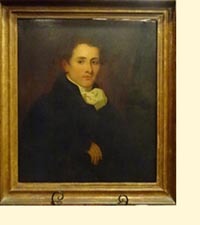 According to the pedigree produced by The Royal College of Arms, Samuel Shepherd Folker was born on 30 September 1789, the only child of Samuel and Susannah Folker. He was baptised at St.Margaret with St.Nicholas in King's Lynn on 3 January 1780. There are references to Folker's Circulating Library in Brighton in lists of 1819 which indicate that prints were loaned out. It seems likely, therefore, that this was the work of Samuel. Nothing else of his life up to the time of his marriage is known. Samuel married Susannah Thorpe at St.Cross in Summertown, Oxford having obtained the necessary licence the previous day. The licence shows that he was a resident of Brighthelmston, the former name for Brighton. Susannah was one of six children of John Wise and Dorothy Thorp of Oxford. Her father, John, had served two terms as Mayor of Oxford. Their first child, Samuel William Thorp, was born on 1 December 1821 but only survived until 7 March that year. The registration of his baptism shows the family as living in North Street, Brighton. An entry in The London Gazette of 13 January 1821 indicates that Samuel had been in partnership with John Brooker and that this was dissolved on 1 January. Samuel continued the business of Looking Glass manufacturer, Carver and Guilder at the premises they had formerly shared at 137 North Street, Brighton. Boore's Brighton Directory of 1822 lists Folker S.S. as Carver and Guilder at Royal Colonnade. 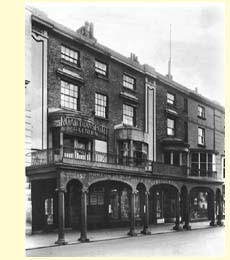 Baxter's Brighton Directory of the same year listed him as of the Royal Colonnade at 136 North Street, Brighton, 'Carver and Gilder to His Majesty' It is likely, therefore, that he provided a service to the Royal Pavillion at Brighton which was opposite his shop. Interestingly, the Royal Colonnade Library was located next door at number 137. Sarah Thorp was born on 6 April 1823 but died on 12 June. John Ambrose was born on 21 June 1825 but died on 18 November. William Henry was born on 30 August 1826 and Maria on 13 September 1828. Both were baptised in Brighton but Maria only survived until 22 April 1833. Samuel and his family appear to have remained in North Street during this period. Samuel extended his business into publishing engravings. In 1929, he was in partnership with J Brooker who was now at 5 Southampton Row in london, published four prints from a set of six entitled Beauties of Brighton . The prints were made by A M Huffam from original paintings by T Harper. There are also other prints in existence which were produced by Samuel in conjunction with John Brooker and others, one of which was a reproduction of a painting by John Constable. It was not unusual for entrepreneurs at that time to produce sets of engravings such as these. Alfred Hanley was born on 28 April 1830 in Brighton and Emma on 5 January 1833 in Westminster. There is a references to Samuel in the Post Office Directory of 1835 as having his business at 3 Bridge Street Westminster. That address is confirmed in Brighton Electoral Registers for 1832, 1837 and 1842, that latter being five years after his death but showing his eligibilty as being the owner of property in Meeting House Lane in Brighton. Nothing more of Samuel's life is known up to the time of his death which took place in Oxford on 5 April 1837 when he was aged 47. He was buried at Summertown, Oxford and his Will was proved at London on 24 August 1839. The existence of a portrait of Samuel, painted in Oxford by the reknown artist Sir Thomas Lawrence, became known in 2016. It is currently located in Florida. It would appear to be one of a pair, the other being Samuel's wife Susannah.